DIT has produced shows for the Kennedy Center, the DC Convention Center, the Verizon Center (a 20,000 seat indoor arena), Red Carpet Galas, government offices, and parties and events both large and small. The group has performed in DC, Baltimore, Miami, New York, Puerto Rico, Philadelphia, San Francisco, and Miami and beyond! Let our dancers add “zing” to your special event! To arrange a dance program, contact Barb. The Kennedy Center's Education Department and their Millenium Stage co-sponsored this show on Latin Dancing. Barb Bernstein produced and narrated this original program. This abstract dance show was produced by DanceInTime and Sinclair Dance. Choreography was done by Sinclair Ogaga Emoghene. DanceInTime has produced many Hispanic Heritage Month Shows for schools, offices, libraries, and organizations which are fun, enriching, and educational. These can include dance instruction, performances, comments about Latin culture and dance histories, and a showing of DIT’s Salsa documentary. We can explain the difference between Salsa, Merengue, Bachata and Cha cha music and then ask the audience to guess which dance is being performed! Barbara Bernstein has been a keynote speaker as well. Click here for a list of DIT’s Hispanic Heritage program venues. Trailer for DanceInTime’s documentary film on the world-wide spread of Cuban Salsa. This video was part of a lesson provided to Bolling Military Base for a Hispanic Heritage program. We explained the principle of frame for leading and following, performed and taught some moves. Short clips from Hispanic Heritage Shows for local libraries are shown. Salsa Lesson at Hispanic Heritage Show for Labor Department. Danceintime also offers a "Women Take the Lead” program suitable for Women's History Month, Women's Equality Day (August 26), etc. The program can include remarks about women’s roles throughout history plus their role in the arts. Women both lead and follow in this dance program, and ladies in the audience can learn the leader’s part during any instruction. This program is empowering and educational---and of course, fun! The audience guessed who's leading, can you? Our DIT pros trained a sports writer for the Washington Post and ABC’s Weatherman for a local dance competition. Sportsnet TV Channel: Watch Dan Steinberg, Washington Post sportswriter, show off the moves he learned from DanceInTime! WJLA TV: Watch popular weatherman Brian van de Graaff do his Merengue routine after training from DanceInTime coaches! 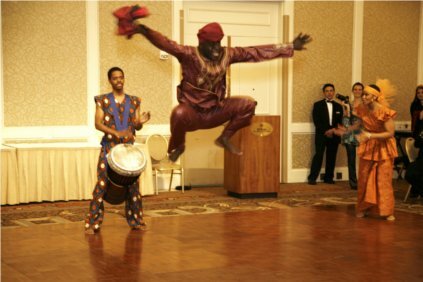 Show For World Bank Gala, With Multiple Dance Styles including African Dancing, Classical Indian Dancing, Folk Dancing, Latin/Salsa, etc. DanceInTime and AM Salsa Show— Including Irish, Ethiopian, and Tango steps, plus Hip Hop and Classical Indian solos (by Sam Yirenkyi and Imani Gaston). A James Bond storyline is woven in! Interested in a ballroom dance presentation? DIT collaborates with a fabulous couple, Tania Nunez and Dmitry Savchenko, that does performances in and out of town. Read about their background here. Got a dance project? DIT is happy to help....."First dance" training, quinceanera preparation, wedding reception/shower entertainment. We even arrange dancing marriage proposals! (See dancingproposals.com.) DIT puts together unique shows for any kind of of special event and any budget! "Saucy" Final Pose in a Routine! "Be Our Guest" Performance at Wedding Reception!